The Daily Scam | Amazon Customer Support… NOT! You are here: Home » Amazon Customer Support… NOT! In mid-August, a woman we’ll call “Martha” needed help with a shipping label for a product she purchased through Amazon but wished to return. She searched Google for the Amazon customer support phone number and easily found 888-341-6651. However, what she found turned out to be one of many fraudulent numbers posted by criminals to appear as Amazon support numbers. She was victimized emotionally, financially, and felt that she couldn’t trust her computer and online accounts. 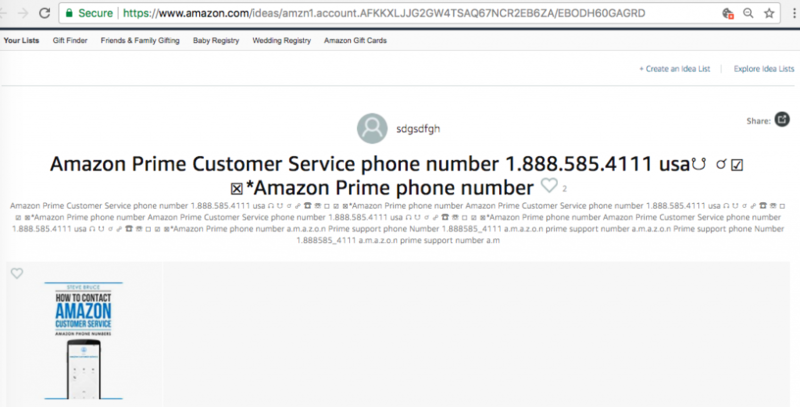 The fake phone number was one of dozens of scam phone numbers cleverly positioned and posted on many Internet sites, including Amazon.com, by criminal gangs to lure unsuspecting consumers. 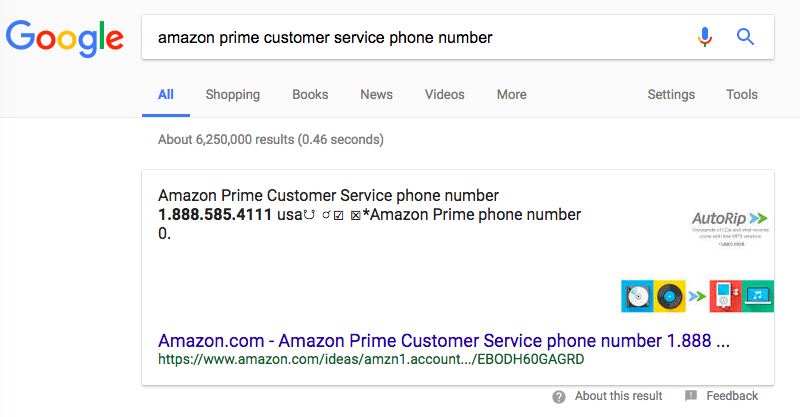 A woman found a phone number for Amazon Prime Customer Service through a Google search and called. She spoke to a man who said she had “fraud on her Amazon account” and needed to verify her identity by going to a store to buy $500 Google play gift cards and give him the numbers. Then the money would be refunded to her after they verified her! Total malarky! The phone number she called was 855-769-6444. After hanging up, she said she received seven calls from 425-448-1894. No messages left and she didn’t answer. BEWARE of callers pretending to represent Amazon Prime and telling you that your membership renewal is due! A woman told us on March 7, 2019 that she received a call from 888-303-6999. A man told her that he was calling from Amazon Prime and her membership renewal was up. He was asking her to pay $32. 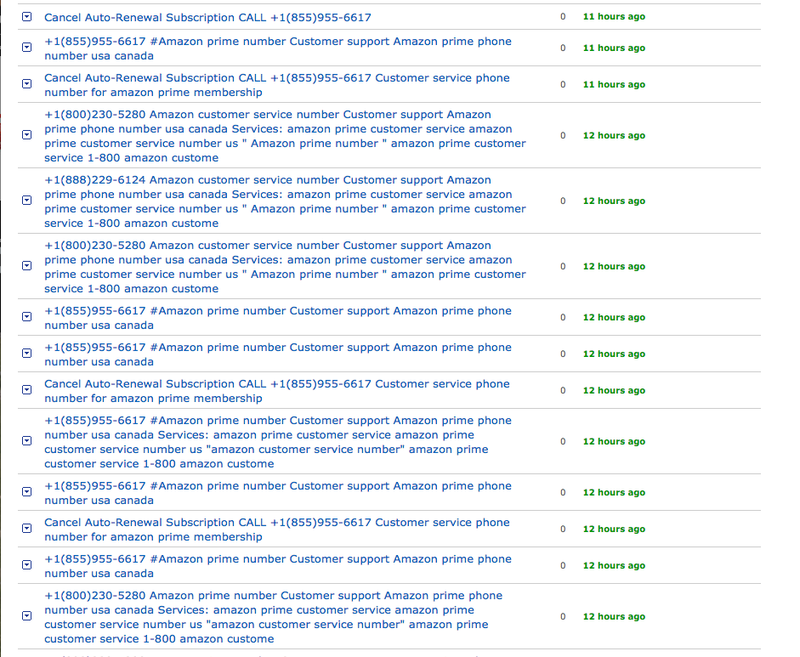 Amazon Prime WILL NEVER call you to renew your membership! Others are reporting this same scam in early March on 800Notes.com from this phone number. “Do not use your apple devices until you speak with apple support representative. Please refrain using any financial activity on your devices. In order to speak with an Apple representative right now press one or call on 518-730-1561. Thanks.” Many people have identified this phone number as an Apple Customer Support scam on the site 800notes.com! 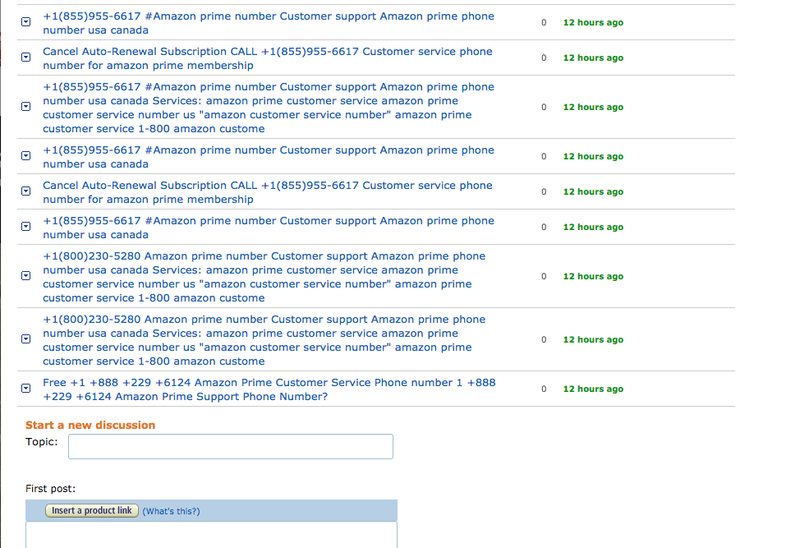 THESE ARE FRAUDULENT PHONE NUMBERS, PUBLISHED BY SCAMMERS AS “Amazon Customer Service” NUMBERS. DON’T CALL THEM! CRIMINALS ARE ALSO POSTING FAKE APPLE COMPUTER CUSTOMER SUPPORT NUMBERS. Read our related article NOT Apple Customer Support Number. Or hear from Heather at Credit Card Services! Are you looking for a good deal on a new or used laptop? Don’t buy from these online stores! Martha said that her call was answered by a man with a Middle Eastern or Indian accent who said he would pass her along to his supervisor to help with her request. Given the many companies who outsource their helpdesks to phone centers in India and elsewhere, she didn’t find it unusual that the men who were assisting her had foreign accents. The manager directed her to a link for gotoassist.com where, he said, he could help her after she entered an access code. (GoToAssist is a service that enables support people to resolve their customers’ technical issues through screen sharing, mouse and keyboard controls.) She thought that the access code would produce the shipping label she was requesting, but the code gave control of her computer to the men at the other end of the phone. As she tells us, within seconds and while talking to her in a way that was distracting and misleading, the men took control over her web browser which was logged into her Amazon account. Quickly, they purchased a hundred dollar Amazon gift card and sent it to an email address that she only saw briefly. She thought it said amazonbrian123@gmail.com but she wasn’t certain. By now, Martha was extremely suspicious, uncomfortable and asked them to explain what they were doing. Keep in mind that she had called them through a phone number for Amazon Prime Customer Support provided by Google search results. Why should she have any reason to be suspicious, until now. The Manager assured Martha that this gift card was to be credited to her account after he completed a couple more things on her behalf. He asked her to enter her credit card information on the Amazon screen, after which he explained that the problem related to the shipping label was associated with her PayPal account. But Martha doesn’t have a PayPal account. Now she was in a panic as she watched the men purchase another gift card. They seemed so adept and quickly navigated the Amazon screens while logged in as her. As she demanded that he stop and get out of her computer, the man at the other end of the phone yelled horribly offensive things at Martha. He froze her browser so nothing seemed to respond to her commands. And what he said to her was so disturbing that Martha was brought to tears a week later as she described this experience. Finally, in a desperate move, she held down the power button, forcing the computer to shut off. It has been a week since this experience. She said she would not turn it back on until she had skilled, protective services she could trust to assess what may have been done to it and tell her whether or not she can trust it. The next morning Martha received a phone call from 706-989-0029, with a caller ID described as “Evelyn Spencer.” But when she answered the phone, a man with a Middle Eastern accent told her he was calling because he could see that she was having trouble with her computer. He began to ask questions about the operating system she was using. Martha quickly hung up, but was visibly shaken. She was certain that this call was somehow connected to her experience with the fake Amazon Prime customer support call the day before. Martha described her ordeal as frightening and emotionally upsetting. Like many, her family has a lot of very personal information on her computer including tax information. They use many online accounts in addition to Amazon and they are all connected through family email. What, exactly, was stolen from her? Could she trust her computer again or was something installed on it that could be used to take control or monitor her family? In the days immediately following these events Martha contacted the real people at Amazon, cancelled her credit card, and advised both about the fraud. Fortunately she will not be responsible for the gift card purchases but that is the least of her concerns. She has reported the incident to the FTC website, frozen her credit with the credit reporting agencies, and checked with all of her financial institutions to be certain that the criminals haven’t somehow gained access to these accounts. As you would expect, her family is now using new passwords for their many accounts. Finally, about a week later, Martha took her computer to a local Apple Computer store genius bar. The staff helped her use software to search for malware that might have been installed by the criminals. They found none but she has turned off wifi on the computer to keep it off the Internet and won’t turn it on again until she has additional assurances that her computer is safe to use. As horrible as Martha’s experiences were, they are not uncommon. The criminals had tricked her and used a professional technology tool to take control of her computer and do harm. They had destroyed her trust in her family’s digital lives and shaken her sense of security and safety in her own home. As a reporter focused on Internet and smartphone fraud, I was saddened but not surprised by her experience. But what struck me as most unusual about these events was the fact that Martha’s troubles began when she used Google to look for an Amazon customer support number. Shouldn’t this have been a simple and safe request of Google? 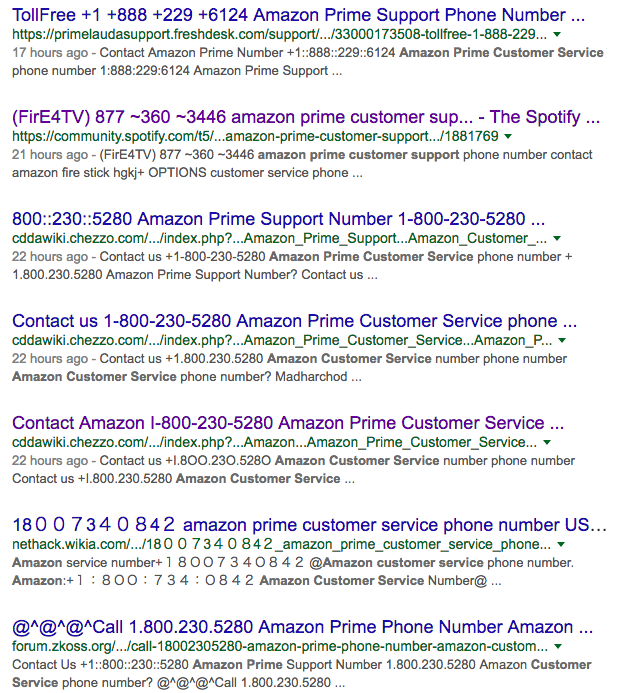 On the morning of August 26, I visited Google and entered “Amazon Prime customer service number.” What I saw was confusing because there were some links with references to a variety of unusual and different phone numbers. I immediately recognized text methods meant to deceive Google and Amazon authorities who might try to find and remove them from search results. To refine my search, I clicked Google’s Tools button and asked to see search results from the past month. The results Google returned were shocking. 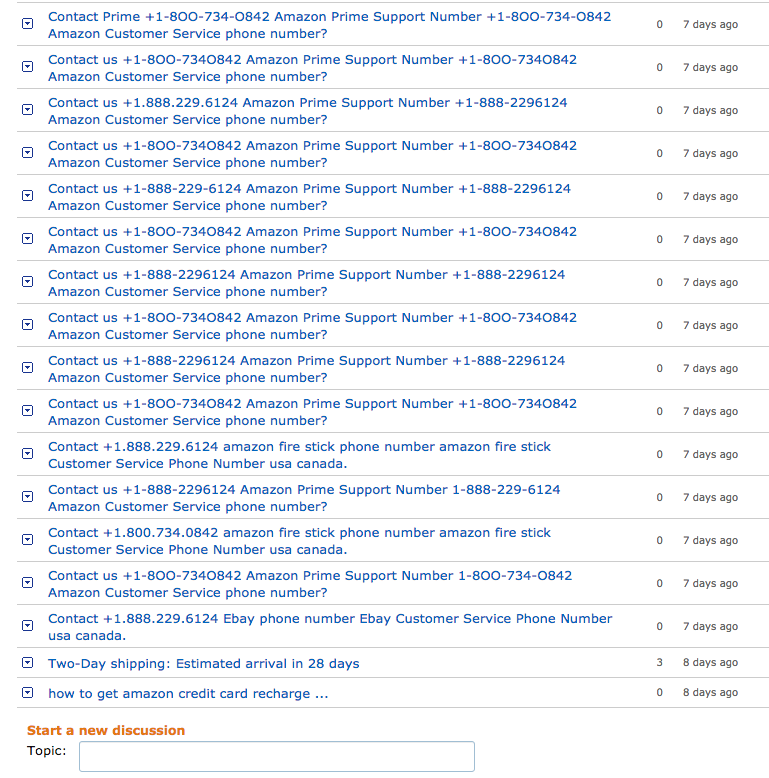 It wasn’t just a few links for scam phone numbers disguised as Amazon Customer Support, it was dozens. Equally important, those scam phone numbers were showing up at the top of Google’s search results. 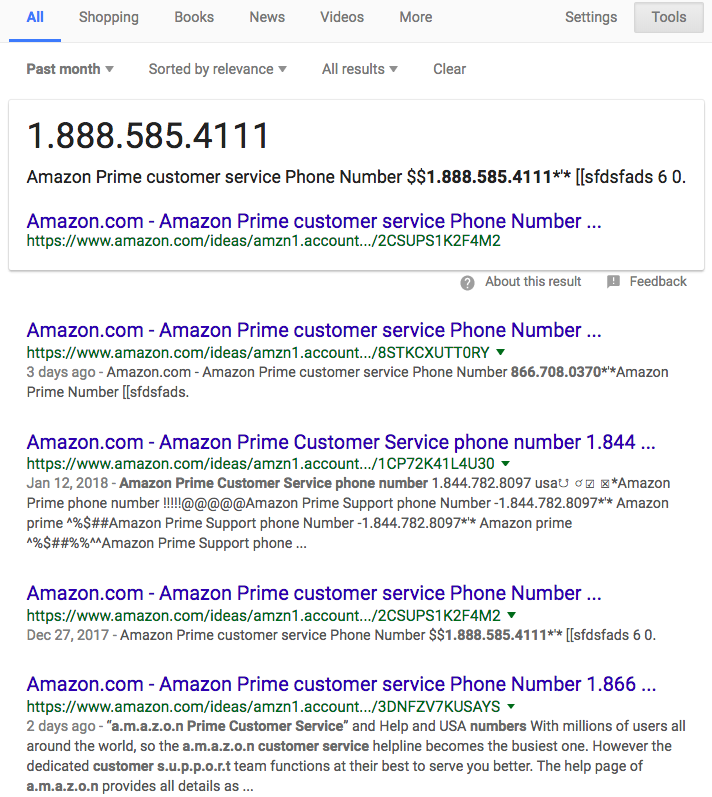 Clearly, the criminals had manipulated Google so that the fraudulent numbers overwhelmed any presence of the real Amazon customer support numbers. Some of the scam phone numbers had spaces between the numbers, others used a capital letter O instead of a zero, others had multiple periods, plus signs, or colons separating parts of the phone number. 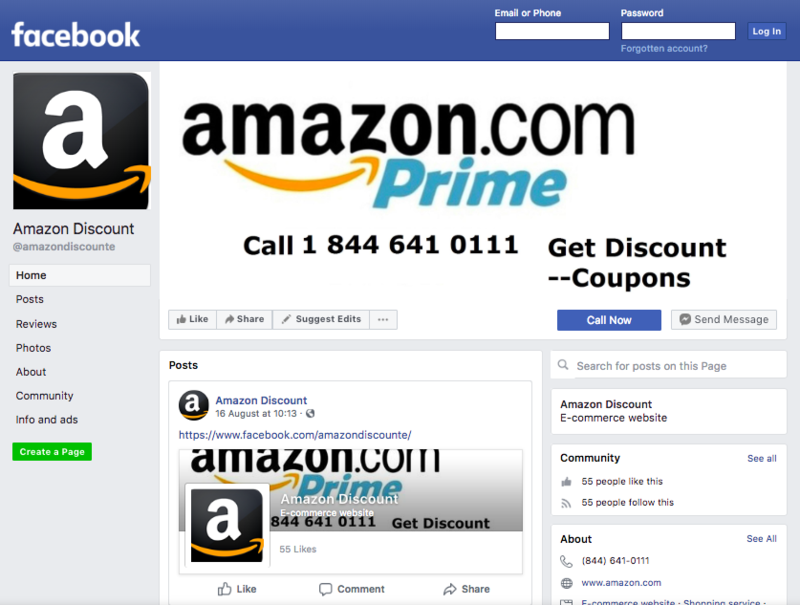 And all of them had repeated references to “Amazon Prime” and “Customer Service.” These scam numbers were showing up on blogs and legitimate websites, like Facebook, Wikia, Chezzo, Spotify discussion forum and many, many more. 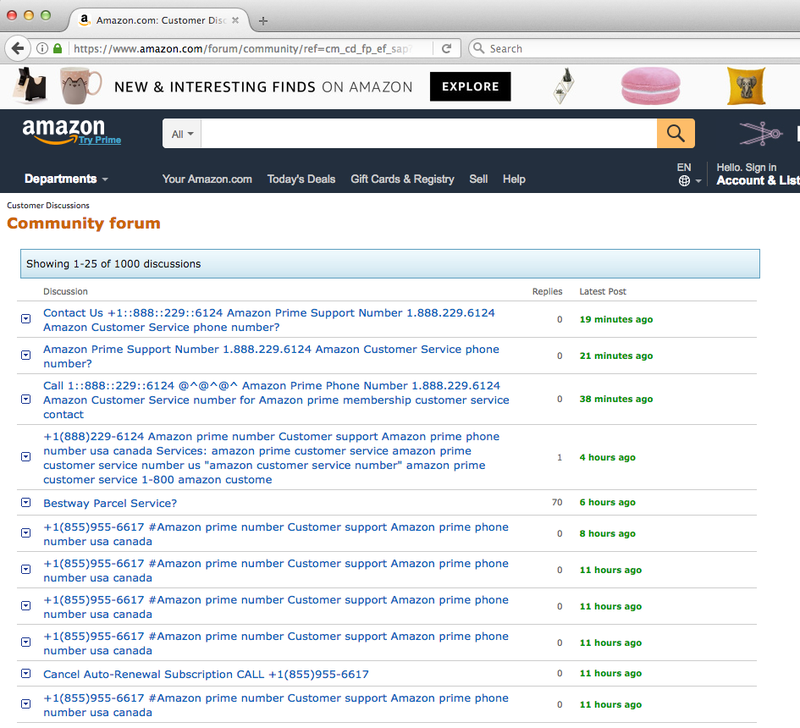 While reviewing dozens and dozens links for fraudulent Amazon phone numbers that had appeared in Google, across many blogs, websites and social media, I also discovered a website named amazonprimehelpdesk.com. According to a WHOIS lookup, this fraudulent website was registered on March 29, 2017 by someone identified as “Nancy Jain.” This website is being hosted in Karnataka, India. (http://whois.domaintools.com/amazonprimehelpdesk.com) This fact and other bread crumbs down this rabbit hole suggest that the criminals involved in this effort are from India. However, look closely at the real phone numbers above compared to these next two numbers! In our web research we’ve also found consumer references to nearly identical but fraudulent phone numbers used by criminals. The nearly identical scam numbers are 800-280-3321 and 800-280-4331. 1. What was the last purchase I made with Amazon and on what date? 2. How much was the most recent transaction on my Amazon account? 1. Why are fraudulent phone numbers able to be posted and remain on their community forum for at least a week? 2. 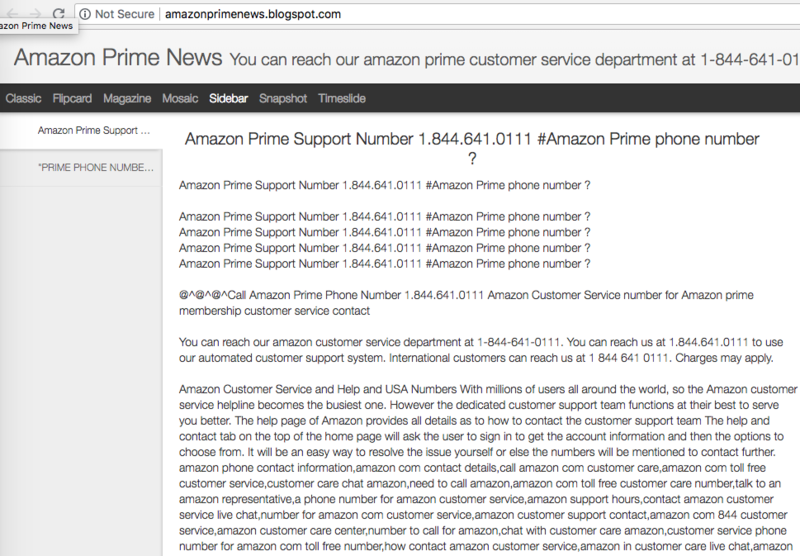 Why doesn’t Amazon post their customer support phone numbers prominently on their website? 3. Why doesn’t Amazon provide some type of warning about this scam for consumers when they log into their Prime accounts? 4. Has Amazon tried to work with Google to find and remove the poisoned links? 5. Has Amazon itself, conducted searches in Google and tried to contact the website where fraudulent phone numbers are being posted? Last week I was paying my bills and noticed Amazon Prime was charging me $7.99 delivery charge for a $7.26 item. Since I am a prime member, I believe this was incorrect. I could not find a phone number on the Amazon website so I looked on Google and found 844-641-0111. The person answered the phone “Amazon Customer Service.” I explained I wanted a refund and they said they would refund it back to my credit card. After a few minutes, they said it wasn’t working but they could refund it to my debit card, which I stupidly gave them. They kept saying they were having trouble processing the code and all of a sudden Amazon Gift Card purchases began appearing. I asked them what was going on and they said they were having more trouble with authorization codes. I told them I had spent enough time on the phone and they said they would straighten it out and call me back. I was already suspicious and checked my credit card and found charges for 6 Amazon gift cards at $50 each. The charges were still temporary so I found the correct number for Amazon and called them. They said not to worry about the charges and that they would take care of them. However, the next day all the charges went through. I called my bank and they reversed them. I closed all my bank accounts and cancelled my credit cards and debit cards. AMAZON WOULD DO NOTHING. Amazingly, the scammer called me back from a different number 917-809-1232 and tried to scam me all over again, which of course I didn’t fall for. 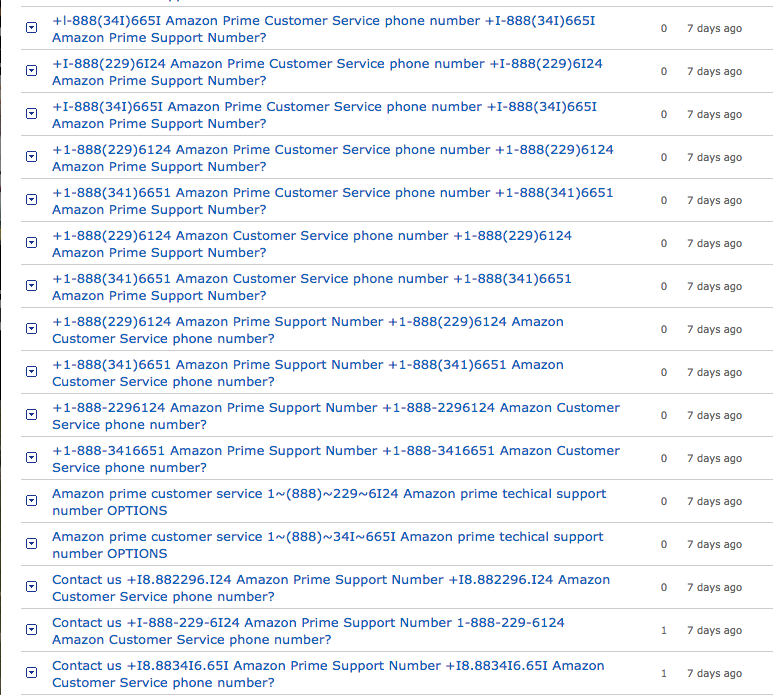 I contacted Amazon again and gave them both phone numbers, but they told me they don’t have a fraud department. Today I wrote Amazon a letter and they replied with ways to avoid being scammed, which was not really helpful. I replied that I had just found several articles going back to at least February 2018 with details about these scams and that Amazon is clearly aware of them. I TOLD THEM THEY WERE NEGLIGENT BY NOT NOTIFYING CUSTOMERS BY EMAIL ABOUT THE FRAUDULENT PHONE NUMBERS BUT THEY HAVE NOT REPLIED. I had never actually purchased anything from Amazon prior to the scam I fell victim to yesterday. I shopped in December on Amazon, but never went past the “add to cart” step in the process. Last month, my pre-paid billing statement had a monthly Amazon Prime membership charge of $11.37, that I didn’t know I had inadvertantly agreed to. I didn’t call to get clarification of the charge until yesterday. I had added my bank card to my Amazon profile, with intentions to purchase my selection, but decided not to because the delivery date was not going to be soon enough. My visit to Amazon.com was an attempt to buy Christmas gifts I couldn’t find in stores as easily and on time. I called the number, and a call center picked up after 1-2 rings. A man with an accent from India answered with a greeting introducing himself as a representative of Amazon. I began to explain my dilemma and frustration with the membership fee, and almost immediately he offered resolution and refund. He sounded very professional. He asked for me to verify my address, phone number, but… What should have been a red flag was him requesting my name and bank information verification later on. He walked me through the membership cancellation process and even asked about the email prompts associated with the selection to cancel. He then directed me to the Google app iTunes gift card. Walked me through those steps with a promise of a code that would be sent to my email. I was under the impression they needed to verify that the card and email was indeed mine. My name was entered initially without success to send because I accidentally entered an incorrect number sequence. He then told me to type in his email so he could watch for it to successfully send since mine was not working. To no avail, 20 min elapsed and my infant was fussing due to teething. He said he would take care of it, to tend to my son, and he would call me back in am hour. The first “dummy” transaction canceled due to that incorrect number sequence entry.. but the second was a success. It prompted my email that fjm5959@gmail.com (email below) had successfully received the transaction. My account was deducted $25.00. I had just paid to put money on this card for a bill, so unfortunately the funds we’re able to be used. Normally, I’m cash only. I called back still naive to the scam, and got another India-sounding “rep” on the line, and briefly described my issue of Amazon now owing me $50.00… He placed me on hold for his fellow “scammer” rep… Which I do not recall the name he called him by, and was again connected to him for assistance. He acted like we were picking up where we left off now the funds we’re debited. He then AGAIN tried getting me to go through the same process promising a “credit” to go through this time…. I asked, “should we select $50.00 instead, since I am now owed $50.00? He responded no, and I was apprehensive about doing the steps again due to the debit of $25.00… He said I could trust him. I requested a supervisor to confirm the bizarre methods. He said the supervisor was in a meeting, that this was legit, and to just do it. My boyfriend asked, “what number did you call?”.. I responded that I wasn’t sure. Men chuckled on the scammer’s end of the phone. This put more doubt in my now perception of the reality of my situation. I asked again for a supervisor… He offered a future call back from his supervisor. The call ended after he said the funds will eventually be put back. As mindful as I am typically, I can honestly say I learned valuable wisdom from this experience. Thankfully, I have never been in any situation like this before… And really have never had to encounter the dark side of people online. So… For what it is, I am no longer naive to scams of this sort. The scammers from my original story just called me (2 days later) and told me the company Microsoft shut down. I said, “let me guess… You need my bank card information to refund my money for Amazon by doing a dummy transaction via Google iTunes gift card. He responded, “uh yes ma’am. May I please have your information so we can refund your $25.00 plus $25.00.” They were going to try and get me for $50.00 this time! Today we received an email from a senior citizen who shared this story with us…. spoke with an “Amazon representative” whom informed me the phishing emails had likely infected my computer as I had open 1 as the subject line indicated an order # and I had an order pending. The fake rep told me they worked very closely with ITE Solutions and transferred my call. In short, I was a total idiot and took the bait, allowing them access to my computers via logmein and writing an e-check for $739.98. I am working with my bank to get payment stopped on the check, but they use a random check number. Yes, I missed every darn clue. Spoke to Amazon today and they basically threw me under the bus. The incident occurred Saturday. 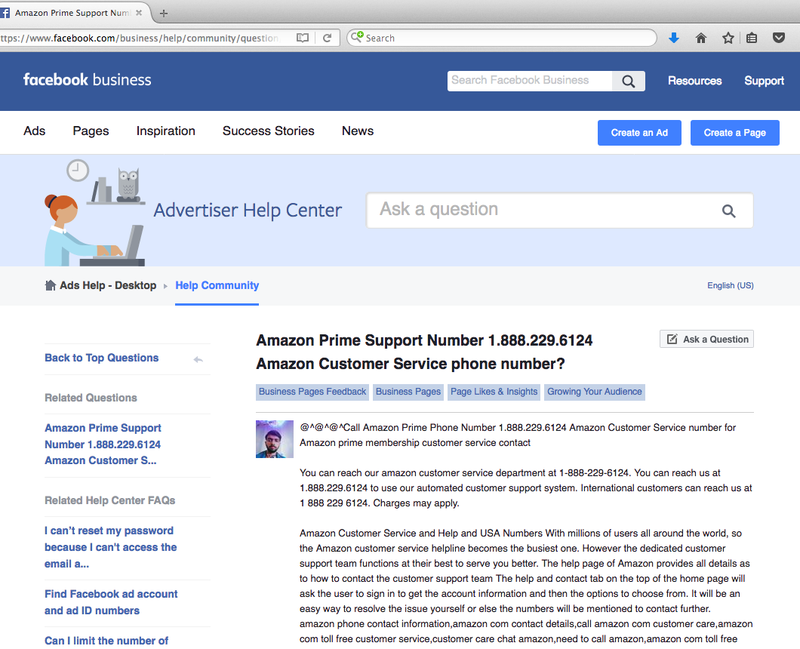 Today I further investigated the phone number which shows high on the Google list for Amazon, Apple, HP and Facebook. I always read how senior citizens get scammed, and say “Not me.” Well it was me and I am very embarrassed that I allowed this to happen. Don’t be their next victim. As always, we have your back! TheDailyScam.com will continue to keep this story updated and post fraudulent phone numbers as we learn of them. You can reach our amazon customer service department at 1-888-229-6124. You can reach us at 1.888.229.6124 to use our automated customer support system. International customers can reach us at 1 888 229 6124. Charges may apply. Amazon Customer Service and Help and USA Numbers With millions of users all around the world, so the Amazon customer service helpline becomes the busiest one. However the dedicated customer support team functions at their best to serve you better. The help page of Amazon provides all details as to how to contact the customer support team The help and contact tab on the top of the home page will ask the user to sign in to get the account information and then the options to choose from. It will be an easy way to resolve the issue yourself or else the numbers will be mentioned to contact further. You are also given one Amazon customer relations number 1-888-229-6124 which is open for 24 hours. Calls to these number cost 7p/min plus access charge. The support team is also reachable at Amazon helpdesk numbers 1-888-229-6124. Amazon Prime is an extremely successful program offered by the online retail giant. It’s estimated that nearly 80 million people in the U.S. are members. Walmart began competing with Amazon head-on when it announced free two-day shipping on all orders over $35 back in February. The competition between the two retail giants is about to heat up. Amazon just announced a counter move to try and attract Walmart customers.